The bungalow that Gaetano Colacci and his wife, Stephanie, bought in Richview looked pretty much as it did when it was built in 1964. “It had pink carpet everywhere, layers of wallpaper in some rooms,” Gaetano says, not to mention those classic ’60s pink tiles and a pink vanity sink in the master bathroom. Homeowner Gaetano Colacci’s furniture business, Alta Moda Furniture, makes custom pieces for clients; he crafted the home’s kitchen cabinets and island. Countertop and backsplash: Caesarstone’s Alpine Mist; cabinet handles: Upper Canada Specialty Hardware; runner: www.overstock.ca. 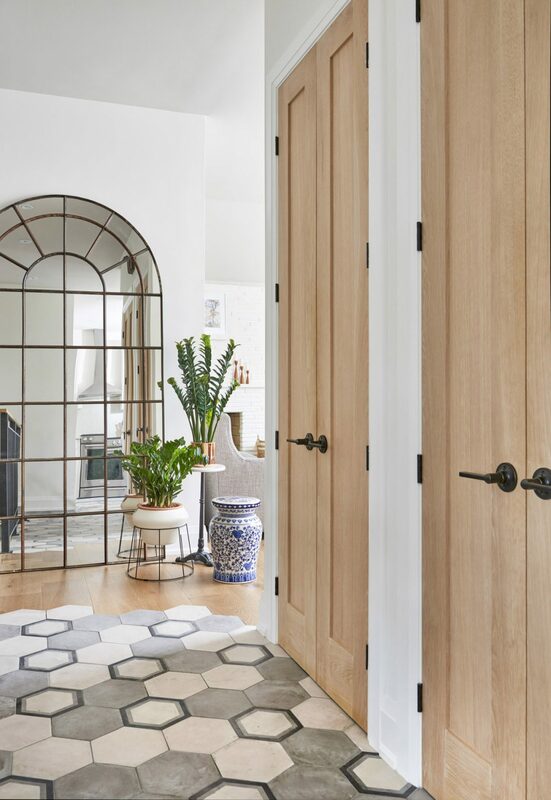 The recently married couple were looking for a house in which they could start a family, and knew they could turn this one into a home they could love, especially since the location was perfect: on a quiet street near parks, somewhere between his work in Vaughan and hers in Oakville. 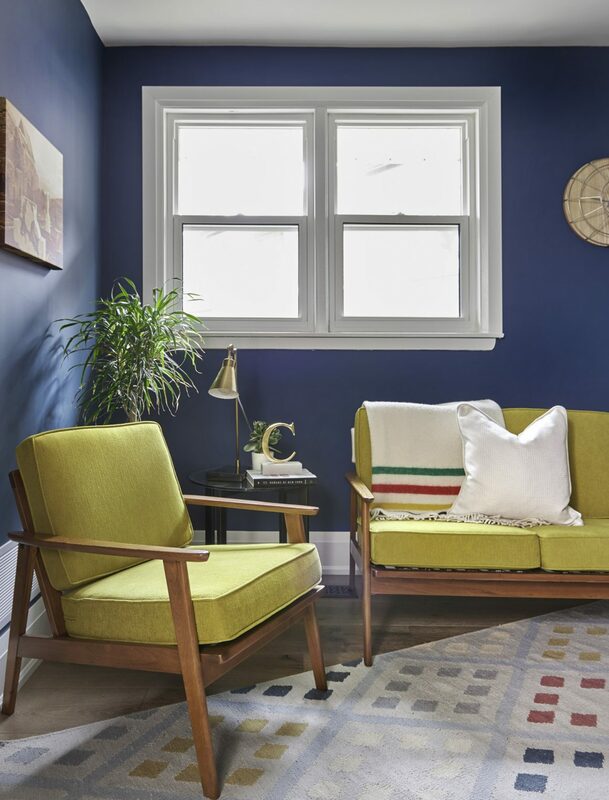 They weren’t daunted by the prospect of a large renovation: he owns a furniture company that builds custom pieces and planned to do all the millwork himself. 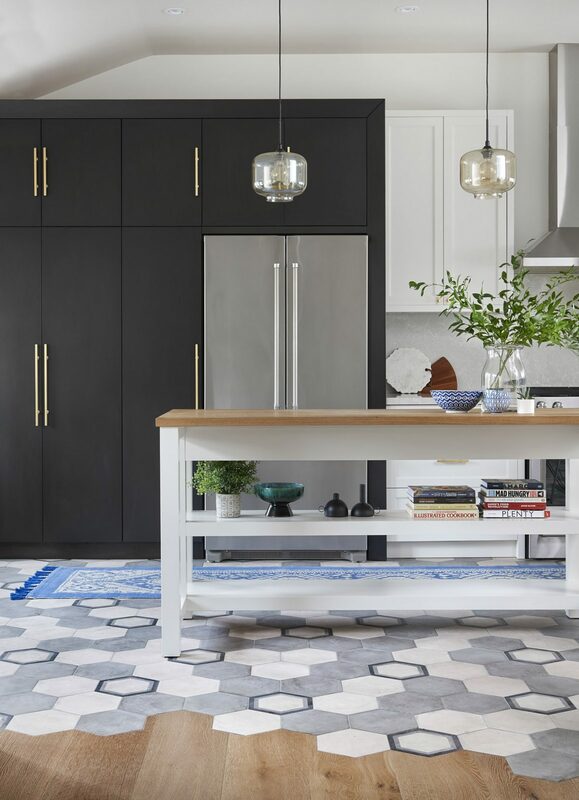 Instead of cutting the entryway and kitchen tiles in a straight line, designer Carly Nemtean used the corners of the hexagonal tile to gradually shift the floor from ceramic to hardwood. Esagona hexagonal tiles: Ciot. 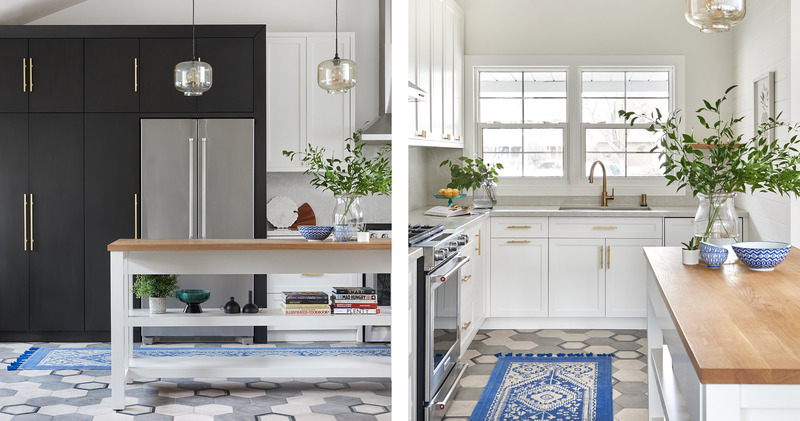 In a small space, with an open-concept floor plan, it can be tempting to run hardwood throughout all the rooms, including the kitchen, says Nemtean, co-owner and principal designer at Carriage Lane Design-Build Inc. 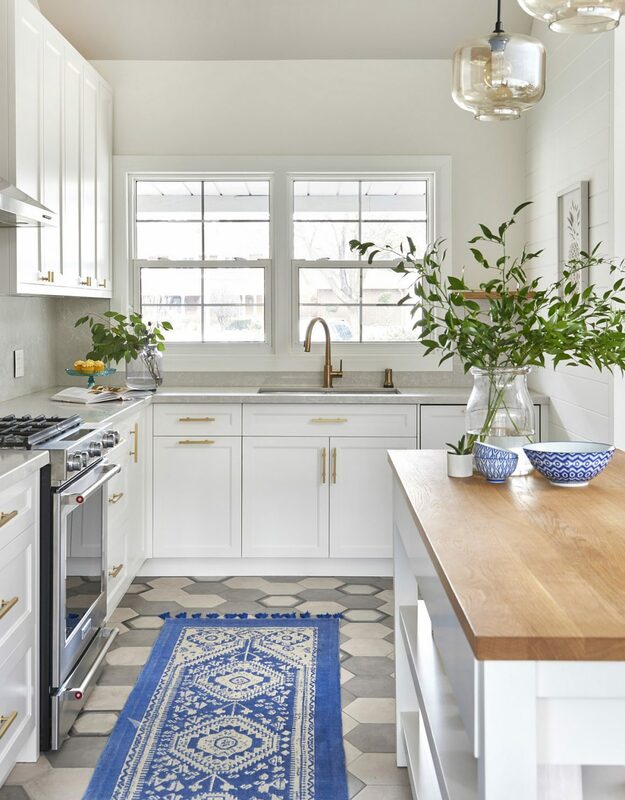 Since Gaetano was determined to have a ceramic floor in the kitchen and because he likes geometric designs, she suggested a hexagonal tile, with the hardwood cut around the sides of the tiles. That way it wouldn’t create an obvious, visually jarring transition strip on the dining room side or between the entry and the living room. 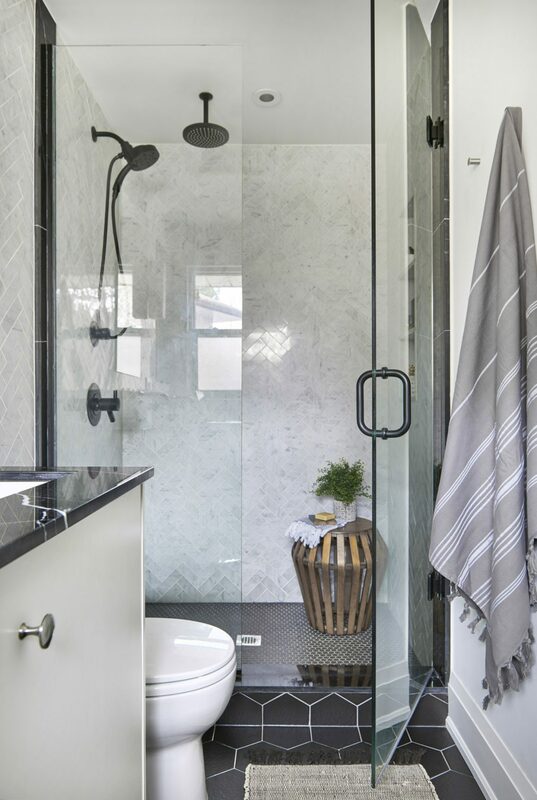 Designer Carly Nemtean chose an oversized white marble herringbone tile for the walls in the master bathroom, and contrasting black hexagonal tiles in different sizes for the shower and floor. 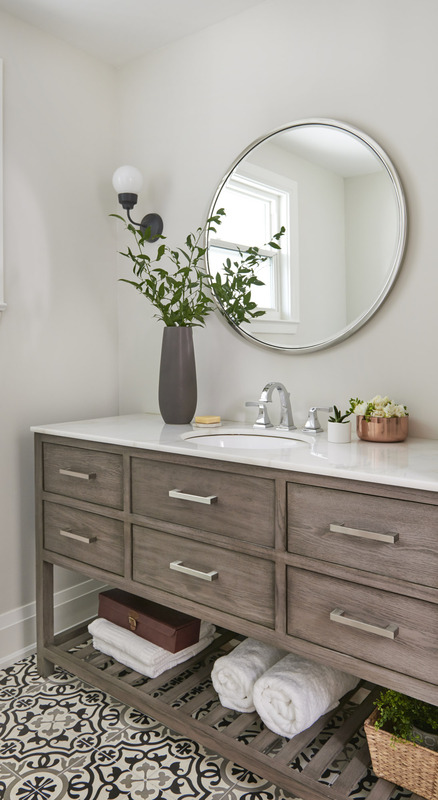 Gaetano made both the white vanity for the master bath, as well as the vanity in the family bath. Countertop in master bathroom: Caesarstone’s Pietra Gray. Also important to the homeowners was having enough pantry space in the cabinets to hide their small appliances, including their microwave oven and two coffeemakers. Size was important when it came to designing the kitchen island, which is long but fairly narrow. “Everyone wants to build these monster islands, but you have to look at the space you have; you can’t force it,” Gaetano says. He used white oak for the top, the same wood he chose for the extra-tall doors in the entryway. Nemtean’s other challenge was to incorporate elements of Gaetano’s style: Mid-century Modern, with a preference for rich, dark colours, with Stephanie’s: more white, clean and feminine. The result is definitely mid-century, but with clean lines and a contemporary feel. By eliminating a closet in an adjacent room, the homeowners had space to create a shower in the master bathroom. “It’s a long but narrow space; we wanted to keep it as light as possible,” says Nemtean. 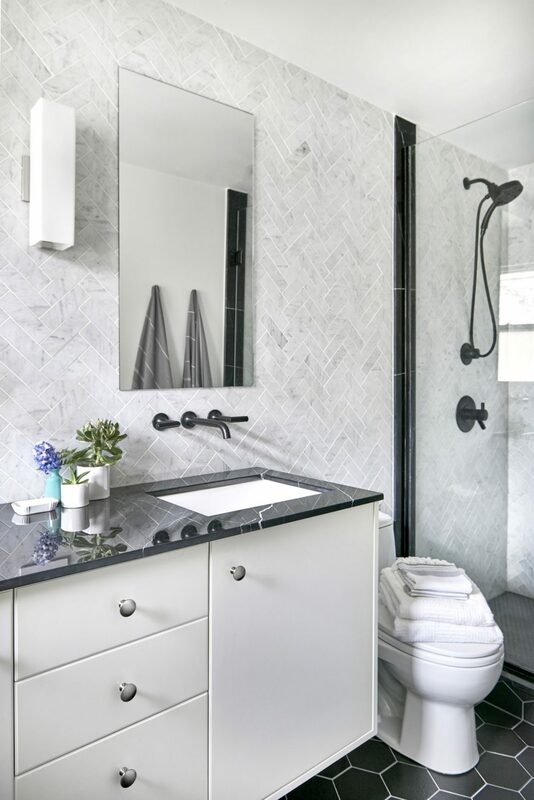 “Visually, we wanted it to feel vast and open and airy.” She chose a white marble herringbone tile for the walls with contrasting black counters, a large black hexagonal tile for the floor, and a smaller black version for the shower floor to give the room a minimalistic ambience. In the family bathroom, she chose a patterned floor tile.